Hello！Could you tell me the model of your printer?Ｉtry to help you find in data base! How to get the OSToto Easter Giveaways? Hunt for the Easter eggs we hide in the webpage, smash them to win random Easter gifts. 1. 15 % off on Driver Talent. 2. 20 % off on Driver Talent. 3. Buy 1 and get 1 free - buy Driver Talent, get iOSToto (valued $34.95) for free. How to use the promo code? 1. If you win the promo code, enter it in the the checkout page's coupon code box to activate it! 2. If you win the buy 1 and get 1 privilege,you will get a purchase link that contains 2 products with 1 productâ€™s cost. Just follow the on-screen instructions to activate it. Note: All the promo codes are valid before April 19th, 2017. If you use Windows 10, you can try to run Driver Talent as administrator. And check the USB port is normal firstly. Get crackling and popping sound or even no sound from your computer built-in speakers or headphones? The sound card canâ€™t be recognized by Windows 10/8.1/8/7/XP/Vista? In most cases, those sound problems are closely related to your sound drivers. Any outdated, missing or corrupted audio drivers may interfere in the normal communication between your computer and your sound card, which results in the error that sound card canâ€™t be recognized by Windows 10, Windows 8.1, Windows 8, Windows 7, Windows XP and Windows Vista. Before you searching for the audio drivers for your Windows computer to fix the sound card, youâ€™d better make sure that the audio device settings are properly issued. After ensuring all your audio cables are securely connected, for a loose cable could cause some sound problems. You can try the potential solutions to troubleshoot crackling sound or other sound problems as below. 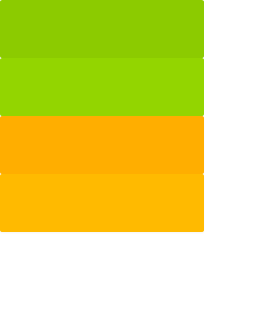 â€¢Double-click â€œSpeakersâ€� (the default playback device) with a green checkmark. â€¢Turn to the â€œAdvancedâ€� tab and adjust the audio quality to â€œ16 bit, 44100 Hz (CD Quality)â€� under the Default Format box. And then click â€œOKâ€� to see whether the crackling or no audio problems persist. If not, try another audio format level till the problem solved. To improve the sound quality, some sound driversâ€™ manufacturers may set â€œEnhancementsâ€� enabled by default. While sometimes it could also trigger sound issues when they arenâ€™t functioning properly. To turn off sound enhancements, navigate to Playback devices -> Speakers -> Enhancements. And then check the â€œDisable All Enhancementsâ€� checkbox. Click â€œOKâ€� to save changes. Go to Playback devices -> Speakers -> Advanced. And then tick the â€œAllow applications to take exclusive control of this deviceâ€� option box under â€œExclusive Modeâ€�. Click â€œOKâ€� to save your changes. If all the above solutions have been tried, but none of them helps to solve sound card errors, you should update your audio drivers. Sound driver missing, sound driver crashing, sound driver conflicting or sound driver disappeared can undoubtedly lead to sound card malfunction. To download a best-matched audio driver for your sound card within minimum time, you might as well seek for a professional driver updater. Driver Talent, a widely-used driver updater utility, aims at making your time more valuable, which could intelligently detects the incorrect sound driver and then download and install the most compatible audio driver on your system instead. It works well with Windows 10, Windows 8.1, Windows 8, Windows 7, Windows XP, and Windows Vista, either 64 bit or 32 bit. Below is how. Click the button below to get Driver Talent instantly. Step 1. Launch Driver Talent, click "Scan" and it will detect all your Windows drivers. The sound driver will show to you after scanning if it is an impropriate one. Step 2. Download and install the best-matched audio driver by one-click â€œRepairâ€� or click â€œUpdateâ€� to install the latest one. Step 3. Reboot your computer after the installation to make the newly installed sound driver take effect. Hope this post could be helpful for you to handle sound card drivers related issues. If have any confusion about the detail instructions, leave comments below and we will reply you as soon as possible. Many of you Windows users may encounter the network driver not working, network drivers not found, network drivers installed but not working dilemmas. Those series LAN driver problems reveal that the current network driver installed on Windows 10, Windows 8.1, Windows 8, Windows 7, Windows XP or Windows Vista is incompatible with your system. To fix the faulty LAN driver and get your internet connection back, youâ€™d better download a network driver which matches your Windows PC. Downloading a LAN driver through visiting your computer manufacturerâ€™s website, finding it in the download page according to the model of your PC seems to be a good choice. While downloading the best-matched Ethernet drivers have never been easy, for many of them may not available in official website. Of cause you can search on the Internet to chasing down LAN drivers and then manually installing them. But your computer may be attacked by viruses or malicious code once the faulty network card driver is downloaded. 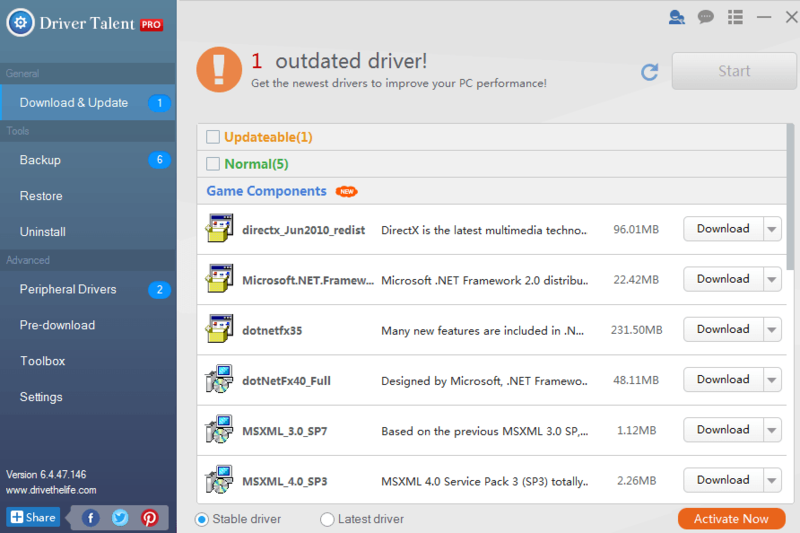 If you prefer to download and install the WHQL network card driver in a quick and safe way, you can count on a professional Windows driver update utility tool, like Driver Talent, a popular driver updater utility that can detect network driver missing, broken, or corrupted status and then find the most suitable one to download and install within a few minutes. Whatâ€™s more, it supports almost all major computer brands including Dell, HP, Lenovo, Asus, Acer, Toshiba, etc. and commonly used Windows operating systems such as Windows 10, Windows 8.1, Windows 8, Windows 7, Windows XP and Windows Vista, either 32-bit or 64-bit. Notes: If the internet connection is not available, you can try Driver Talent for Network card, which is designed to fix the no Internet connection issue by downloading and installing the correct network driver offline. But you need another internet-available computer to download it and then transfer the .exe file onto your computer to install other drivers. Click the â€œDownloadâ€� button below to get Driver Talent and then follow the step-by-step guide install Ethernet drivers. Launch Driver Talent and click â€œScanâ€� to find out if your network driver is missing, broken or corrupted. All the improper drivers will be listed after scan, your LAN driver included. Click â€œRepairâ€� and Driver Talent will begin to search for the best-matched drivers for your computer and then download and install them automatically. Click â€œUpdateâ€� if you want the most updated LAN driver. Make a PC reboot to let the newly installed LAN driver take effect. If you find this post hopefully solved your problems, you can share the all-in-one Windows driver updater and management tool, Driver Talent or Driver Talent for Network card with your friends. Motherboard, as one of the most important parts of the computer, controls almost all the functions. Accordingly, motherboard drivers play the role of the instructor, controlling communication between all the hardware components and your Windows operating system. Missing or broken motherboard drivers could result in various problems, such as driver conflicts, BSoD (Blue Screen of Death), etc. Since motherboard controls the entire operating system, it is recommended you download and update your motherboard driver regularly, also known as BIOS or the chipset driverâ€™s update in order to keep it functioning in the optimal status. In order to download and install the correct motherboard drivers for your computer, youâ€™d better figure out the manufacturer and model of your motherboard if you want to get them from their official download page. The most common motherboard manufacturers include Asus, MSI, Asrock, Gigabyte, AMD, Intel, Dell, HP, etc. Those manufacturers release driversâ€™ updates from time to time to resolve crucial issues related to system crashes and sluggish PC performance. It is an alternative to get the most-compatible mainboard driver from the official website. While they are not always catch up with the most up-to-date motherboard driver versions. For now, more and more users choice goes to a powerful driver installer and updater when comes to driverâ€™s download and update. Because with the Windows drivers updater tool, say Driver Talent, a popular Windows drivers updater utility, you can save countless time and energy from hunting for the correct motherboard drivers to installing them manually. Have a look at the following step-by-step instructions and update your motherboard drivers. Driver Talent works perfectly with Windows 10, Windows 8.1, Windows 8, Windows 7, Windows XP, and Windows Vista. And it supports all Windows PC brands, like Dell, MSI, Acer, Asus, Asrock, ThinkPad, Gigabyte, IBM, AMD and more. Click the button below and you will get Driver Talent instantly. After the installation is completed, launch Driver Talent. Let it scan your PC to identify all the drivers installed on your Windows OS. All the missing, outdated, broken, corrupted or incompatible drivers will show to you after step 1, the motherboard driver included. Click â€œRepairâ€� and Driver Talent will fix them automatically by downloading and installing the most compatible motherboard driver for your Windows OS. You are also able to update those faulty drivers to the latest versions by clicking â€œUpdateâ€�. Remember to restart your computer in order to make the newly-downloaded or newly-updated motherboard drivers come into effect. Now your motherboard driver should be the best-matched partner for your motherboard and your system will perform in tip-top condition. It is annoying to get the display driver stopped responding and has recovered error prompt. Not to mention display driver keeps crashing when playing games. Or display driver failed to start, display driver get stuck on startup circumstances etc. Generally speaking, all those series issues can be triggered by broken, incorrect, or outdated graphics drivers. To keep your computer from display driver stopped working or other video related problems on Windows 10, Windows 8.1, Windows 8, Windows 7, Windows XP and Windows Vista, you need to download and update display/graphics/video drivers from time to time. The channels to download and update compatible AMD, NVIDIA, Intel or other brand display drivers are various, from Internet searching to official website downloading. But both of the two methods may be time and energy-consuming, for sometimes you may get the wrong graphics drivers or outdated ones that may lead to driver crashes after all the efforts. Thus here we introduce a professional and widely-used Windows drivers download and update utility, Driver Talent, which can download and updates the best-matched video drivers for Windows 10, Windows 8.1, Windows 8, Windows 7, Windows XP and Windows Vista, both 32-bit and 64-bit. Once Driver Talent is launched, you are able to click â€œScanâ€� to make a safe detection for your Windows drivers. Below is how. Click the â€œDownloadâ€� button below to install Driver Talent on your computer. After the installation, launch Driver Talent and then click "Scan". 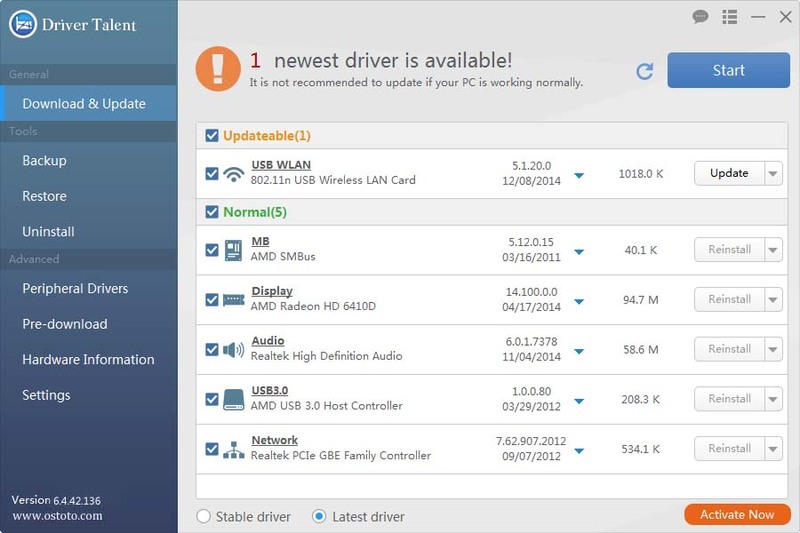 Driver Talent will automatically make a thorough scan for all drivers installed on your computer to find out if there is any problematic driver, such as outdated, missing, broken or faulty display drivers. All the error drivers will be listed in the scanning results. Click â€œRepairâ€� and Driver Talent will begin to search for the most compatible graphics drivers in the background and then download and install them accordingly. Or you can choose install the latest display drivers on your computer by clicking â€œUpdateâ€�. After all the above three steps, all you need is to restart your computer to make the new display drivers come into effect. Hope this post could successfully help you to get out of display driver stopped working or keeps crashing problems and download the proper display/graphics/video drivers. Should you meet any problems during the downloading or installing driverâ€™s process, please donâ€™t hesitate to contact us for help. Microsoft ended its Mainstream Support for Windows Vista on 2012, and it will stop the Extended Support on April 11, 2017. Though Windows Vista was not the best Windows ever, it did have some amazing features that users loved. If you still use Windows Vista, it is important for you to download driver updates for Windows Vista in case Windows Update makes no drivers changes and results in unexpected system issues. Windows Vista drivers are programs that ensure computer to communicate with hardware or devices. Besides, the drivers also allows for smooth function of your Windows Vista. Outdated, missing, broken or incompatible drivers for Windows Vista can cause errors or conflicts like Driver_Power_State_Failure error, MSVCP110.dll missing error and more. So you need to download the best-match driver updates for your Windows Vista computer. You can still get Windows Vista drivers in a lot of ways before Microsoft stop supporting the OS, such as downloading drivers for Windows Vista from the manufacturersâ€™ or the PC brandsâ€™ websites, from a third-party websites, from Windows Update, etc. However, once the support is ended, the websites will not update the drivers any more. In addition, if you still run Windows Vista on some computer of obsolete model, it is never easy to find proper Windows Vista drivers for it. Meanwhile, you need to be careful when download drivers without signatures from other websites. Non-official or non-WHQL drivers may contain virus and help you say good-bye to your beloved Windows Vista. To avoid such awkward drivers download, you can use Windows Vista driver download utilities like Driver Talent. It is able to help solve problems arising due to the use of outdated, corrupt or incompatible drivers, and download and install the best-match drivers for your Windows Vista computer. You can download Driver Talent via the button below and follow the 3 easy steps to download and install proper Windows Vista drivers. Step 1. Launch Driver Talent. Click â€œScanâ€� to detect all the faulty drivers on Windows Vista PC, such as missing drivers, incorrectly configured drivers, outdated drivers and more. Step 2. Click â€œUpdateâ€� to download and install the best-match drivers. You can also choose driver versions by your own. If there are any driver problems, click â€œRepairâ€� to fix them instantly. Step 3. Once Driver Talent finishes the installation, it will notice you to restart the computer. This will make all the driver changes take effect properly. Now you can enjoy your Windows Vista in optimal performance. Windows 7 is the stable and classical Windows OS. After the Windows 10 upgrade, many users choose to downgrade the new OS to Windows 7 out of their habit or preference. If you are going to downgrade Windows 10 to Windows 7, or just reinstall Windows 7 on your computer, it is important to download and install Windows 7 drivers. Windows 7 drivers are programs that ensure for the perfect performance of your PC by keeping communication between the hardware and the Windows OS. If there are missing, outdated, incompatible drivers after the system changes, your computer will work improperly and bring you about many headaches, such as DRIVER_POWER_STATE_FAILURE blue screen error, audio recording error, GPU fan problems, etc. To get rid of such culprits in your daily use of your laptop or desktop and make you enjoy the features of Windows 7, you need to download and install drivers for you Windows 7 computer. Though Windows 7 drivers get you attention, you will find it never easy to download proper drivers for your Windows 7 computer, either for the 32-bit or 64-bit device. Downloading drivers form the manufactures’ or PC brands’ websites may be a good idea, but the many of them does not provide driver updates for those obsolete computers. For other sites, you may download drivers with computer virus or non-official drivers. Now that it is troublesome to download drivers from Internet, you may prefer a high efficiency method - professional Windows drivers download utilities, like Driver Talent. It is one of the safe driver download software that provides you with all the proper Windows 7 drivers you need. It is smart enough to detect any missing, outdated or incorrectly configured drivers on your computer and download and install the best-match driver updates for Windows 7. It is speedy to download Windows 7 driver updates with Driver Talent. But before your download drivers, you need to download and install Driver Talent (by clicking the button below). Step 1. Launch Driver Talent and click the “Scan” to make it scan over your computer for faulty drivers. Step 2. Click “Update” if there are driver updates available. It will download and install the best-match drivers for your Windows. You can also click “Repair” if it finds broken or incorrectly configured drivers. To install USB drivers for new devices, go to “Peripheral devices” tab. Step 3. After the installation, don’t forget to perform a restart. This will make the driver updates take effect properly. Now your Windows 7 can operate for longer time without issues and yield more performance when carrying out tasks with the newly-installed Windows 7 drivers. If you are going to reinstall Windows 8.1 or 8 on your laptop or desktop, then you need to download compatible Windows 8.1 or 8 drivers. Windows 8.1 drivers or Windows 8 drivers are programs that allows for smooth function of your PC by facilitating the communication between the Windows 8.1/8 and the hardware on both 32-bit and 64-bit devices. In your daily use of Windows 8.1 or 8 computer, or after the Windows 8.1/8 reinstall, if you encounter problems like no LAN access, USB 3.0 crashes, Bluetooth not working, etc., mostly, it is the matter of Windows 8.1 or 8 drivers. Any outdated, missing, broken or incompatible Windows drivers can cause such problems and affect the continuity of your office work. So it is really important to download and install proper driver updates for Windows 8.1/8 to improve the performance or enhance the stability of your computer. You have many choices to download drivers for your Windows 8.1/8 computer. For example, you can download the driver updates via the manufactures’ or the PC brands’ website. Windows Update is also available for Window 8.1/8 drivers updating. However, if you have an obsolete computer whose brand’s website does not support the Windows 8.1/ 8 drivers download any more, or if Windows fails to download the driver updates at the same time, you may get stuck on the drivers download process. For those who like a time-consumed workaround, they often take the one-click solution, namely using professional driver download software. Driver Talent is one of such professional driver download tool utilities. It will help you download the best-match drivers for Windows 8.1 or Windows 8, including the latest official or WHQL Windows drivers. Besides, it will detect all the faulty drivers and notice you to repair them. Step 1. To download proper Windows 8.1/8 drivers, you need to download Driver Talent firstly. Step 2. Launch Driver Talent. You can click “Scan” to start detecting your Windows computer for any missing, outdated, incompatible or corrupted drivers. Driver Talent will notice you the faulty drivers after the scanning. Step 3. You can click “Update” to download and install the best-match drivers for your Windows 8.1/8, or click “Repair” to fix those problematic drivers instantly. If you want to install the drivers manually, you can also go to “Settings” and find the driver download folder. When all of above are finished, you can restart the computer to make the newly-downloaded Windows 8.1 drivers or Windows 8 drivers take effect. Now enjoy the new features on your Windows 8.1/8 computer. Network drivers ensure the Ethernet or WiFi connection on your computer and fix no WiFi available, unidentified network and other network issues. Graphics or display drivers enhance performance of the display adapters when you’re playing video or gaming. They are able to stop your computer from ghost touch screen or other display issues. Audio drivers ensure perfect quality of audio output and avoid issues like no sound or microphone not working. Mouse, keyboard and other input devices drivers enable optimal performance of input and prevent issues like no mouse pointer, keyboard and mouse not working and more. Other drivers like USB drivers, Bluetooth drivers, battery drivers, etc. are also important to the smooth function of Windows 10. Outdated, missing, broken or incorrectly configured drivers can result in serious issues I’ve mention above and affect the use of Windows 10. If you encounter driver problems, you need to go and download the best-match drivers for your Windows 10 computer. You can download some driver updates from the PC brand site. But downloading proper Windows 10 drivers has never been easier. Many sites of mainstream PC brands have not renewed their driver database for a long time. Some Windows 10 drivers are not available for downloading. If you’ve upgraded the OS to Windows 10 on an obsolete computer, you may fail to download the best-match drivers for it. To easily download official or WHQL drivers for your Windows 10, you can use the all-in-one driver download utilities, for example, Driver Talent. Most of such software are free and include almost all the drivers you need. For Driver Talent, it can intelligently check all the faulty Windows 10 drivers and download the drivers for hardware and devices. Step 1. Download and install Driver Talent on your Windows 10 PC. You can click the button below to download Driver Talent directly. Step 2. Launch Driver Talent and click “Scan” to detect all the faulty drivers on your computer, including the outdated driver, missing driver, incorrectly configured driver, etc. For those USB devices, you can go to “Peripheral devices” tab to perform a scanning and then download proper USB drivers. Step 3. When it finishes the scanning, you will be notice to “Update” or “Repair” the faulty drivers. You can click the button to download and install the best-match drivers for Windows 10 (64-bit or 32-bit) instantly. After the install, restart the computer to make the new drivers take effect. Thus your computer will be facilitated by the new Windows 10 drivers. Just enjoy the new features on your Windows 10. Lots of users report that there’s no Internet connection after reinstalling Windows 10, Windows 8.1/8, Windows 7, Windows Vista or Windows XP. Both the ethernet driver and Wi-Fi driver are missing. If you have no wired or wireless network driver installed, your computer can’t access the Internet. To solve this issue, you could use a dedicated network adapter driver installer like Driver Talent for Network Card, which supports installing a wide range of ethernet and Wi-Fi adapter drivers without Internet connection. It is a one-stop solution to use Driver Talent for Network Card to download and install network drivers without Internet connection. It has a file size of 182MB because all major brand network adapter drivers are integrated in its local library. Therefore, it enables you to install network drivers or LAN drivers without Internet connection. Click the button below to obtain Driver Talent for Network Card directly. Here is the step-by-step guide to use Driver Talent for Network Card to download and install network drivers without Internet connection. For more details, you could refer to the User Guide of Driver Talent for Network Card. Step 1. Run the downloaded .exe file to install the client on your Windows desktop or laptop. Step 2. Driver Talent for Network Card will start the scanning process automatically and it doesn’t require you to make any advanced configurations during the installation process. Step 3. Once the installation is complete, the network driver has also been installed successfully. You could find that your computer has Internet connection again. Note: To get the specific ethernet or wireless network driver for your offline computer, Driver Talent for Network Card has to be downloaded and run on another Internet-available computer. Then you could copy the .exe file to your offline computer to install network adapter drivers without Internet connection. It's much better to download and install it on your computer before you format or reinstall the Windows system. Driver Talent for Network Card supports all brand PCs, including Asus, Acer, Dell, HP, Lenovo, Samsung, Toshiba, Sony, etc. Besides, it applies to Windows 10, Windows 8.1, Windows 8, Windows 7, Windows Vista, Windows XP, etc. The Internet connection drops occasionally on your 32-bit PC? No Wi-Fi, no sound, no bluetooth, USB device not recognized, touchpad not working, keyboard not working on your Windows 10 64-bit computer? Your printer is not working when connected to a Windows computer? In most cases, the computer issues occur because of incompatible or outdated drivers. If you download and install the right drivers, your computer will run properly. To avoid errors and conflicts, you need to install and update Windows drivers for your PC occasionally. Windows drivers play significant role in the working of hardware devices and the operating system or software that use it. There are many resources to download Windows drivers, but getting the correct drivers has never been easier. You can navigate to the manufacturer's website to search for drivers, but many of them may not be available any more. The best and quickest method is to use a dedicated Windows drivers download utility, like Driver Talent, a free tool which contains more than 500,000 driver packages and offers the latest official or WHQL drivers for Windows 10, Windows 8.1, Windows 8, Windows 7, Windows Vista and Windows XP, applied to both 64-bit and 32-bit. What's more, it can intelligently check your outdated, corrupt, broken or missing drivers in seconds, and then automatically download and install the most compatible drivers for your Windows computer. Here are 3 easy steps to use Driver Talent to quickly download and update drivers for Windows 10, Windows 8.1, Windows 8, Windows Vista and Windows XP. For more details, you could refer to the User Guide of Driver Talent. Step 1. Download and install Driver Talent on your computer. Step 2. Launch Driver Talent once the installation is complete. Click the "Scan" button to make a full scan of your PC and it will reveal all your problematic drivers, such as the one you miss, the one that works improperly. Step 3. There are two options for you to solve your Windows driver issues. You could click “Repair” or “Update”, and Driver Talent will begin to automatically download and install the latest drivers on your computer. 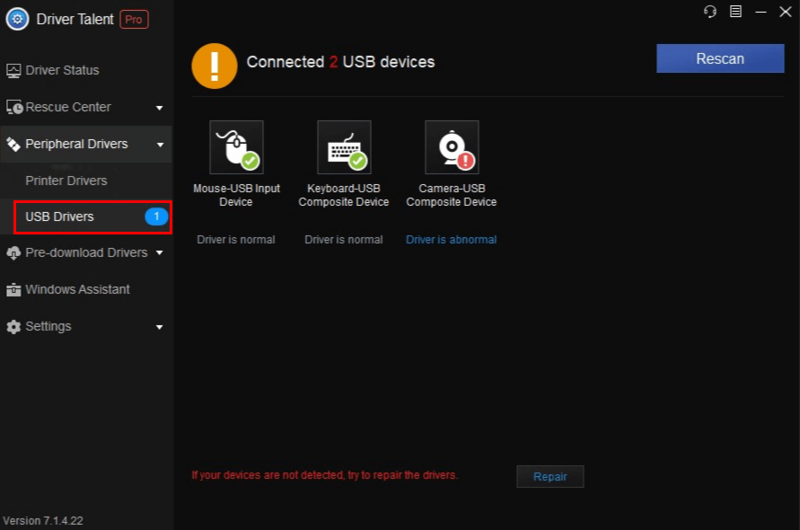 As for the USB-connected peripheral devices, you need to switch to the "Peripheral Drivers" menu to install the relevant USB drivers. Finally, be sure to reboot your computer to allow the newly-downloaded drivers to take effect. Apart from Windows drivers download and update, Driver Talent comes with further advanced features, such as drivers restore, drivers uninstall, drivers pre-download for another PC, PC Repair (no sound, no video, no Wi-Fi etc. ), hardware detection, VR support check and PC speed up, etc.